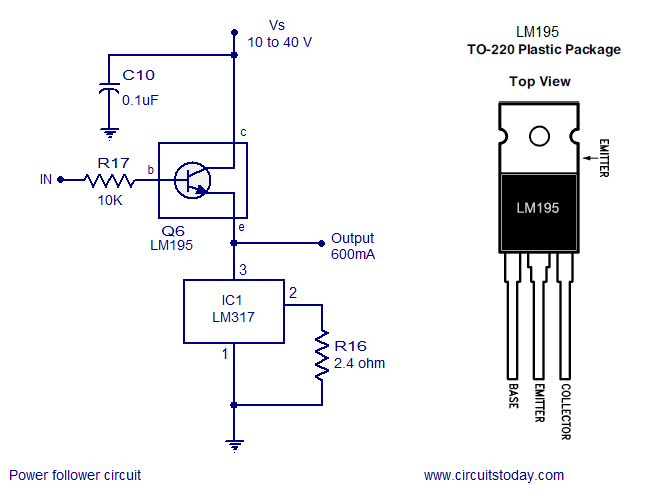 Few useful circuits using the voltage regulator IC LM317 is shown here. LM317 is a three terminal voltage regulator IC from National Semiconductors. The IC is capable of delivering up to 1A of output current. Input voltage can be up to 40V and output voltage can be adjusted from 1.2V to 37V. 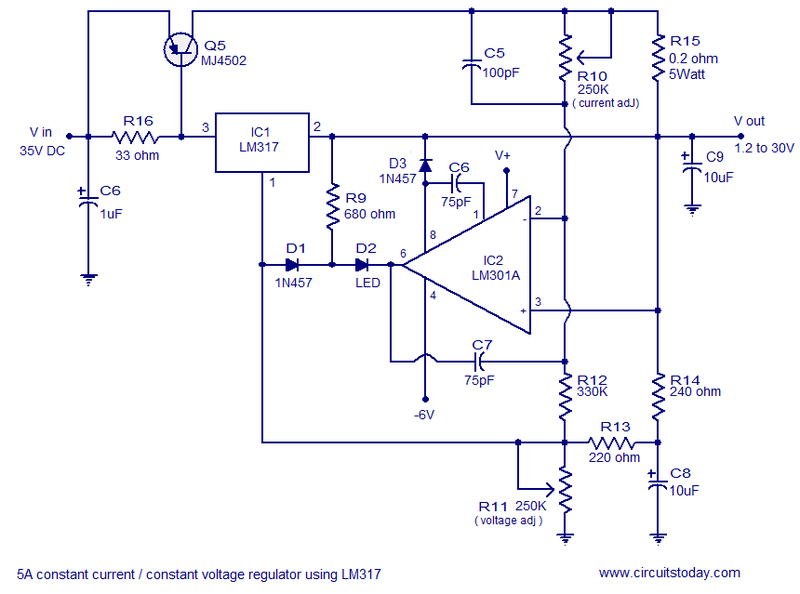 Typical positive voltage regulator circuit using LM317. 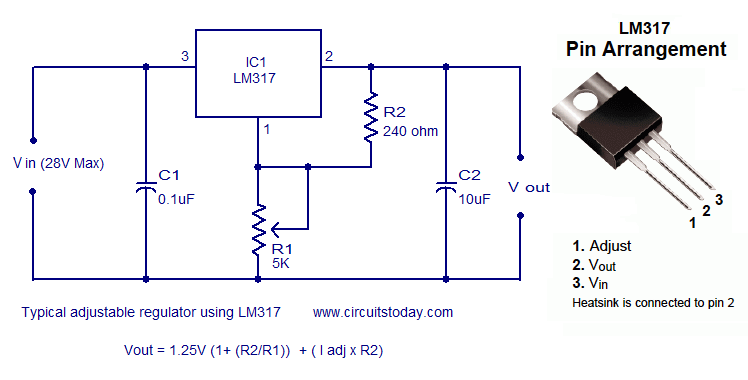 A classic voltage regulator circuit using LM317 is shown above. Input voltage is fed to the pin3 (v in) of the IC and regulated output voltage is available from pin 2 ( V out) of the IC. Resistor network comprising of R1 and R2 connected in association to the pin1 (adj) is used to set the output voltage. C1 is the input filter capacitor while C2 is the output filter capacitor. The output voltage of the regulator circuit depends on the equation, Vout = 1.25V (1 + (R2/R1)) + I adj R2. Adjustable regulator with digitally selected output. A very simple adjustable regulator circuit with digitally selected output is shown above. The circuit is a just a modification of the ordinary voltage regulator using LM317. Parallel to the resistor R4, four more resistor branches each with a transistor switch is added and these resistors can be included or excluded in to the circuit by making the corresponding switching transistor ON. In simple words the output voltage will be according to the logic level of the digital inputs A, B, C and D. Logic high at terminal A will make Q1 ON and so resistor R5 will be added parallel to R4 and so on. Addition of each resistance in parallel to the R4 will reduce the effective resistance of the path and so the output voltage of the resistance will decrease in steps. The width of each step depends on the value of the resistors you choose. Resistor R4 sets the maximum output voltage and it is according to the equation V out Max = 1.25V (1 + (R4/R3)) + (Iadj x R4). 5A constant current constant voltage regulator. The circuit shown above is of a 5A constant current / constant voltage regulator using LM317. Such a circuit is a very inevitable gadget on the work bench of an electronic enthusiast. In addition to LM317 , LM310 a single operational amplifier is also used in the circuit. Diode D3 and capacitor C3 forms a compensation circuitry for the opamp. The output voltage of the regulator circuit is fed back to the non inverting input of the opamp while output voltage of the opamp is fed back to the inverting input of the opamp itself through capacitor C7. Resistor R16 limits the input current to the LM317 and base current to the transistor Q5. C6 is the input filter capacitor while C9 is the output filter capacitor. POT R10 can be used to adjust the output current while POT R11 can be used to adjust the output voltage. LED D2 provides a visual indication when the circuit is running in the constant current mode. Power follower circuit using LM317. A voltage follower circuit is a circuit which produces considerable current gain while the voltage gain is maintained unity (or close to it). A power follower is nothing but a voltage follower with high current capability. A typical voltage follower circuit designed using a small signal transistor can handle few hundreds milli amperes of current. The power follower circuit shown below can handle up to 600mA of output current. The circuitÂ shown below is nothing but a emitter follower circuit using power transistor LM195 (Q6) with a current limiter circuit based on LM317 is connected at the emitter. In simple words the current limiting circuit replaces the â€œemitter resistanceâ€ of a classic transistor emitter follower. Capacitor C10 is the input filter. LM195 is a monolithic power transistor with complete overload protection. All circuits shown above can be wired on perf board. Any way a PCB is the better option if you can make it. 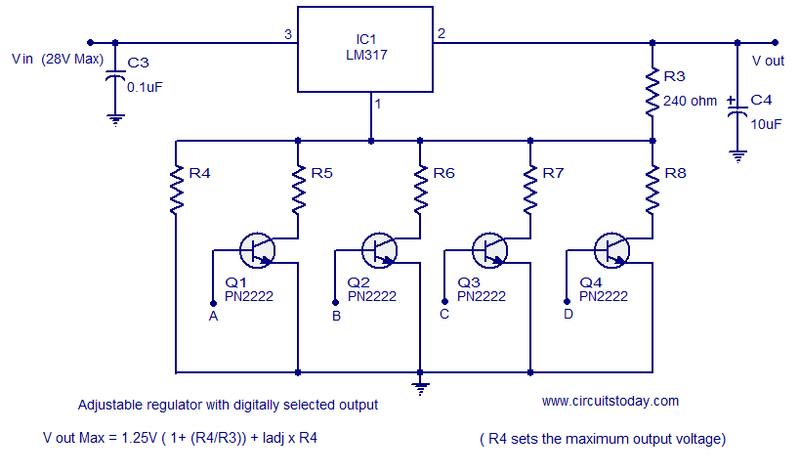 Maximum load current LM317 can handle is 1A. A heat sink must be fitted to the LM317 in all applications where the output current exceeds 250mA. The heat sink can be a 2 x 2 x 2 cm Finned Aluminium type. LM195 also requires a similar heat sink. Use a holder for mounting LM301. MJ4502 requires a 6 x 6 x 2 cm Finned Aluminium type heat sink. The dimensions of the heat sink are just approximate values and you can use slightly bigger or smaller ones according to the availability. Always bigger is better and there is nothing good a heat sink as large as possible. Input and output filter capacitors in these circuits are preferred to be Solid tantalum type. This circuit does not simulate. Are you sure of all the values being correct? it goes from 1.26V to 6.57V. Tried it both under Proteus and LTSpice. I’ve built this but from 37v in went down to 30v only. Is there a way that it can lower more on output? I don’t think this circuit works properly. I’d like to use this circuit to power my delay circuit that uses an RC circuit. I am producing delays in the 20mS to 100mS range with pretty good accuracy and repeatability. But the delay can change when the battery input voltage varies. I think a regulated voltage would help in this matter. The delay circuit remains unpowered until needed. Will an LM317 based circuit work consistently when suddenly powered up or would input/output capacitors be needed to stabilize it, similar to when they are used for ripple control? Otherwise, I didn’t think the capacitors would be needed since everything is being powered by a battery. Denotation of R1 and R2 is wrong in the first circuit. 240 Ohms is R1 and 5K is R2 respectively. And why 28 V max?? Ref: 5A constant current constant voltage regulator. Please let me know where to connect pin 4 and pin 7 of IC2 301A. Tantalum capacitors do have polarity and can be used to replace electrolytic capaciors with similar capacitance and voltage ratings. The postive terminal is marked with a small + sign and has a longer lead. What are the power ratings for the resistors in the first regulator circuit… 240 ohms, and 5k, and please what type of variable resistor will i use, preset or pot. 240 ohms is 1/4 watt. The pot can be preset if you application is for a constant voltage supply for a specific circuit. If you want to make it into a variable bench supply use a pot so that you can easily adjust and also with better the longevity of the variable resistance. I tried the first circuit given. Is the circuit correct? My pot burned when I brought it close to maximum resistance. Why? Thanks for the info, sir. I have built the basic LM317 circuit, and it works. But I find that if I set the output on 1.3v, add 300ma of load, I will see it drop to 1.2v or even less. With a little more load, it will go down to 1.1v. That seems to be far more drop than there should be for a regulated voltage output. Heck, that’s 20%! I have tried it with input voltages of 6v and 9v. This makes no difference. There is a heat sink on the device. Is this normal behavior for the LM317? Is it perhaps that I am using it at the extreme low end of its range? Is the circuit for the 5A CONSTANT CURRENT REGULATOR-CONSTANT VOLTAGE REGULATOR CIRCUIT, can we just inject a 6 or 12 volts DC VOLTAGE at the input instead of 35 VOLTS DC? I am planning to build this to be a mobile type regulator of 5 volts 3A power supply for my internet router with a 12 volts 4AH gel type battery while in the car traveling home. Can this be possible? how can receive input voltage this regulator? If you duplicate this supply you have to use two independent windings of a transformer. both winding should be galvanic-ally isolated. Could this design be used for a negative regulator, with appropriate changes to regulator and pass transistor? ON THE 5 AMP CIRCUIT TO MAKE A DUAL +- POWER SUPPLY CAN I JUST USE A DUAL 35V-0-35V TRX AND DO THE SAME CIRCUIT FOR NEG SIDE. Hi you require dual 6 volt supply. its a nice circuit.i use it before,now want to get a circuit which can handle max current 10A ,but without step down transformer.SMPS based ,and the parts are available in local market.thanks.waiting for your kind reply.